"Uh oh!" -- Those are two words that you don't want to hear anywhere close to an aircraft, let alone inside a multi-million dollar item like a modern gas turbine engine. AeroEd has personnel on staff that are expereinced in recovering items that can be found where they don't belong - like inside an engine or down a dark hole. 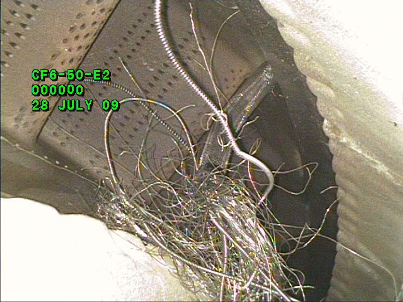 If you think your only choice is an expensive OEM overhaul, think again - you may be able to recover an item using safe, proven methods that can save hundreds of thousands of dollars - and a call to your insurance company. Our goal is to save you money and, if possible, restore your equipment to airworthy condition without breaking the bank. Click here to see a case study. With our state of the art tools, combined with our experience, techniques, patience and skill - you can be assured that every possible means of a safe, low risk recovery will be carried out. Overhaul and transportation of item to and from overhaul, including transport stand. Locating, leasing, transport of short term replacement spare engine. Engine change in the field. Unknown damage discovered in overhaul and non-routine or out of scope repairs required for return to service. Out of service time for an otherwise perfectly serviceable aircraft. The General Electric XL PRO™ Plus VideoProbe® system with working channel and retrieval tools provides a high-performance platform for item recovery. Our inspectors plan a recovery like a surgeon does an operating procedure - with the state of the art tools, engineering drawings, multiple borescopes, and the maintenance manual we are prepared to recover any item that can be found and can fit through the access port. Call us - turn that "Uh oh" into an "Atta Boy!" *All recovery jobs require hold harmless statement, not laible for damage or superficial evidence left on article from work performed. Please call for more details on terms and conditions. 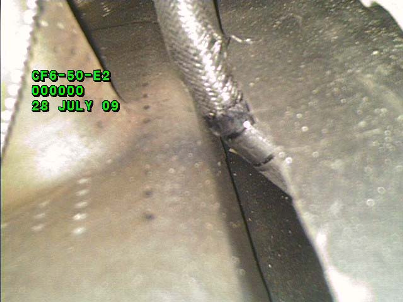 The following pictures illustrate a true story or one of AeroEd Inspection Services' customers. The customer got their borescope stuck in a third party's engine during the course of an on-wing inspection. The customer was in a position to decide between dropping the engine and sending it to the shop to be opened and having the object recovered in-situ. The clock is ticking in these situations, missing revenue flights, leasing another engine, engine removal, transportation, shop visit, rigging, MPA run, reinstallation, and more all add up to a significant cost - into the hundreds of thousands of dollars. 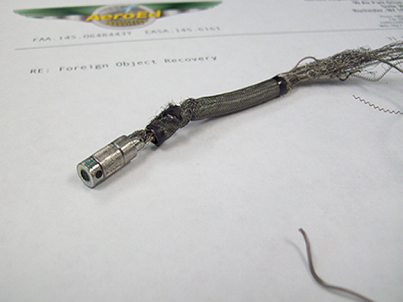 The solution, for a fraction of the cost, is to perform a foreign object recovery operation. 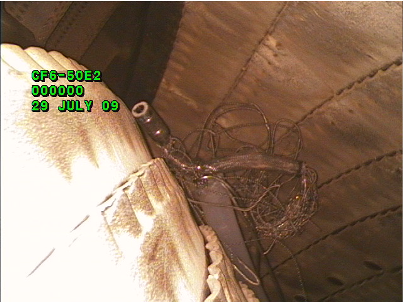 This customer is in a situation where their borescope is stuck in a gap between the cumbustor the turbine section of a CF6 engine. In their efforts to free the borescope, the insertion tube was severed, leaving the tip, articulation section, and a bird's nest of various cables, wires, and braid behind. Plus, the object became wedged in so tightly, it was securely stuck in the gap. Typically, using specialized recovery techniques, tools and borescopes, the object is securely gappled and removed from the gap it is stuck in. Then, it can finally be removed from the engine entirely - despite it's somewhat larger configuration than the way it went in. In this case we have a happy ending and a lot of money saved - the engine is ready to go back into service.